There are many reasons why people like to complete DIY projects around their home. One reason is an individual may simply enjoy the process. Another is saving money on an update or remodel. Many DIY projects done around the home often include some type of change to an existing room. However, this is also a way to add functional items to your home. 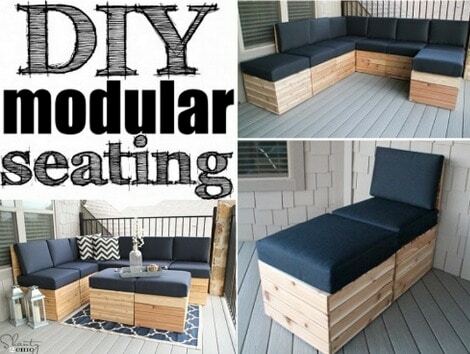 This includes a DIY modular sofa. Making your own furniture is not as complicated as it sounds. All you will need to do is make sure to use the proper tools and materials. A set of plans will also be needed. However, you have the opportunity to modify the design of a DIY modular sofa to create something that is really unique. Building a DIY modular sofa means you will be building various pieces that work together. You will need a variety of tools for this project. This includes a tape measure, a saw, power drill, and screws. These can all be found at a local home improvement store. The wood needed to build a DIY modular sofa will also be found at many home improvement stores or at a local lumber yard. You will be working with wood just like any other type of woodworking project needed to make a functional item. The best thing about this project is you will likely spend less for all the material for a DIY modular sofa than the cost of a high-quality sofa at a furniture store. You have the option to build pieces for your DIY modular sofa that can be set up in many ways. This is the beauty of modular furniture as there are multiple ways it can be arranged in your home. All you need to do is determine the type of paint or stain to achieve the look that is desired.